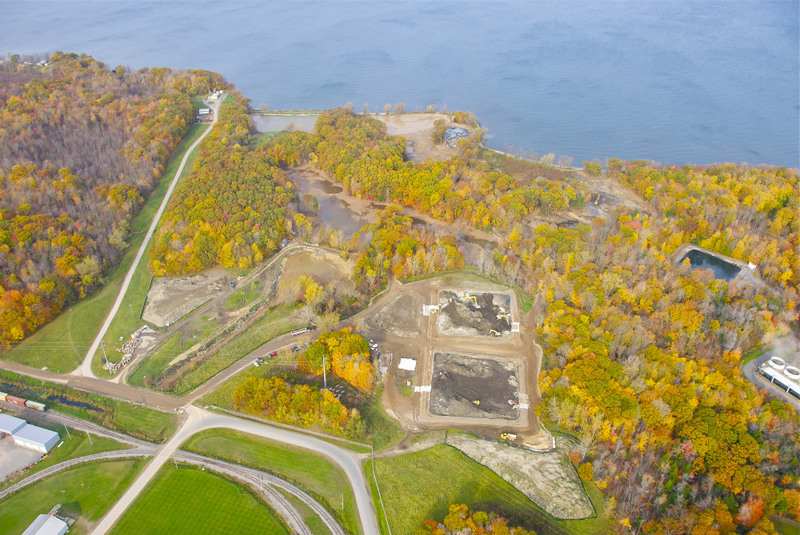 NRC served as the remedial construction contractor on this EPA managed site that involved the management of both non-hazardous PCB impacted sediments and TSCA hazardous PCB impacted sediments in several ponds and marsh areas in close proximity to Lake Ontario. Non-hazardous soils were slated for disposal at a subtitle D landfill in NY, and the hazardous soils were slated for disposal at a subtitle C landfill in NY. Over 1 mile of access roads were improved to facilitate access to the ponds and marshes and over 10 acres of clearing and grubbing activities were performed to provide access to the work areas. The project included the removal of over 31,500 CY of TSCA regulated sediment and over 53,000 CY of non-TSCA regulated sediment via GPS controlled long stick excavators. The initial plan for the management of the sediments was to utilize cement kiln dust (CKD) at a 10% dosage rate to dry the materials enough so that it would pass paint filter testing required for landfill acceptance. This approach was acceptable for the management of the non-hazardous sediments, but not acceptable for the disposal of the hazardous sediments. The issue with the hazardous sediments was due to a minimum compressive strength requirement for materials acceptance at subtitle C landfill. The landfill recognized the issue after it had received the first few loads of sediments and refused to accept more of the material until the compressive strength was improved. This was a significant setback for the project since it was schedule to generate and transport an estimated 31,000 tons of hazardous sediments for disposal. Several other subtitle C landfills were contacted to confirm that the compressive strength requirement was a requirement for all subtitle C facilities and not subject to NY facilities only. It was determined that the compressive strength of the materials would need to be improved to meet the disposal facility requirements. 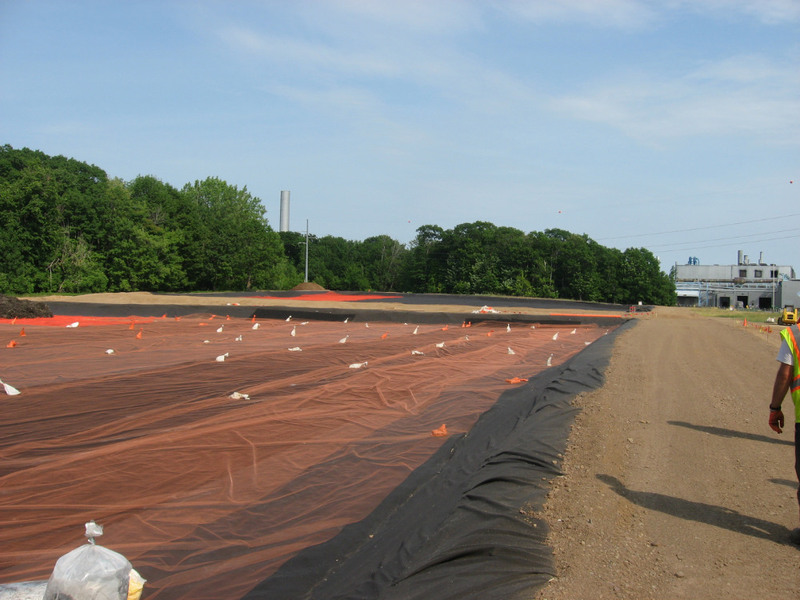 A pilot study was conducted with the sediments at the site to determine the best way to improve the compressive strength to meet the landfill requirements. The results of the pilot study were evaluated based on compressive strength and cost. The findings indicated that the 20% portland and 80% CKD mixture at a 20% dosage rate was the most cost effective option for getting the sediments to meet the landfill compressive strength requirements. The remainder of the TSCA sediments was treated with a calciment 20% Portland and 80% CKD blend at a 20% dosage rate. There were no additional issues with compressive strength of the sediments for the remainder of the project. Sediment was transported by off road dump trucks to two 2.5 acre staging areas with 4’ tall berms and a 40 mil HDPE liner. After stabilization and drying, the sediment was loaded into permitted hauling trailers and disposed of off-site. Water from the ponds was managed by a 100 GPM water treatment plant that included settling storage of over 150,000 gallons, bag filtration, orgno-clay and carbon treatment prior to discharge. Upon completion, the remedial areas were backfilled and restored with an approved ecological restoration plan. All technical performance criteria goals were met including the removal of various overlapping polygons of hazardous and non-hazardous PCB sediment areas. Overall, the project was completed on time and under budget. 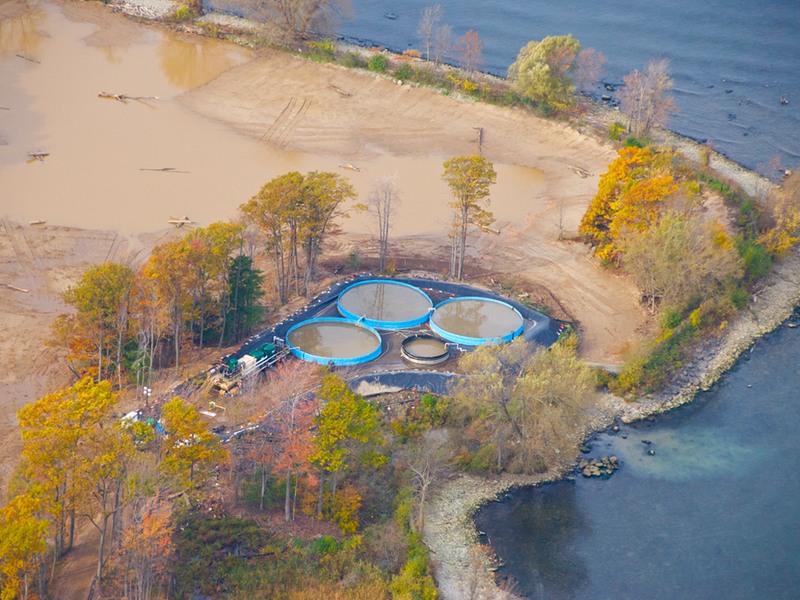 Removal of 31,500 CY of TSCA regulated and 53,000 CY of non-TSCA regulated sediment. Sediment removal by GPS controlled long stick excavators. Construction of two 2.5 acre staging areas with 4’ berms and a 40 mil HPDE liner. Cleaning and extraction of six (6) UST varying in size from 10K to 35K gallons. Water treatment system and storage for over 150,000 gallons.